This week we have been focused on monitoring the productivity and provisioning for the chicks on the island. 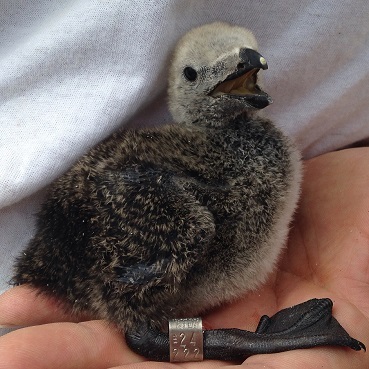 The tern chicks in our productivity plots have been growing strong, many now weighing over 100 grams. So far during our provisioning stints, we are seeing tern chicks mainly being fed herring, hake and sand lance. These are good food sources for the chicks! We have also seen many adult puffins flying into burrows with fish, which means more puffin chicks may have hatched this week. So far we have confirmed that 3 puffin chicks have hatched, but we are seeing puffins enter some of the deeper burrows carrying fish, which suggests more may have hatched as well. We will begin puffin productivity this coming week, where we will do a more thorough search to determine how many chick have actually hatched! 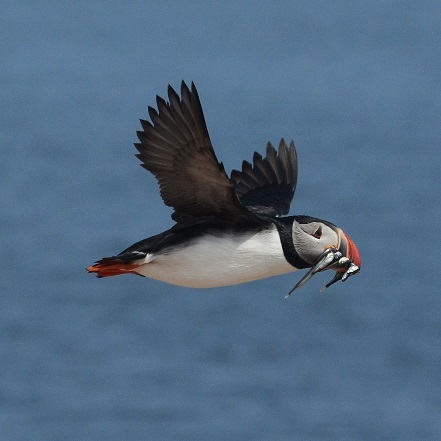 Unlike terns, which usually only bring one fish at a time when feeding chicks, puffins are able to carry multiple fish in their beaks at a time! This makes provisioning a bit trickier, since rather than having to identify one fish, there could be multiple. Also, the puffins tend to duck into their burrows quickly after landing with food for their chicks which can also make identification difficult. We decided to try putting a GoPro in one of our puffin boxes this morning to see if we could possibly use GoPros in some of the man-made puffin boxes to add to our puffin provisioning data. We were able to take some pictures of a puffin chick being fed by its parent! The puffins are my favorite birds on the island, so I look forward to finding more chicks this week! Greetings from Petit Manan Island! Bradford and I have been on PMI for two weeks now, and yesterday we were joined by Kelby and Jenna so now our island crew is complete! A lot of the work so far has depended on whether or not the birds are around and if the weather is nice, but one constant effort has been the daily tower counts. 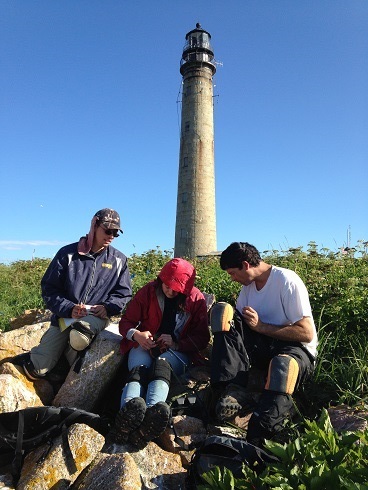 We have been climbing up the 134 steps of the lighthouse once in the morning at 7:00AM and once in the evening at 5:00PM to count the number of Atlantic Puffins, Razorbills, Black Guillemots, Common Murres, and Common Eiders in the water and around the island. In the morning, we usually see around 70 puffins, 50 razorbill, 150 guillemots, 90 eiders and there is a pair of murres that are seen from time to time. This morning, we had our highest counts of the season for puffins, at 121, and for razorbills, at 63. In the evenings, we have been counting fewer birds overall as many have ventured further out to sea to forage for food. It’s been a little over a week since I first came to Petit Manan Island, and I’m already in love with it. Before coming, I was a little skeptical about climbing the second tallest lighthouse in Maine twice a day to do tower counts, as well as the 3-mile foghorn that goes off roughly every 30 seconds, 24/7. I have definitely gotten used to the heights and the foghorn, the latter becoming more like a calming constant throughout the day, much like the constant ticking of a wall clock, only bigger, and much louder. Other than getting used to the ins-and-outs of island life, bird activity has been slow. Generally, the terns and alcids are here during the morning but leave to forage for most of the day, only coming back to roost just as the last rays of light are disappearing over the horizon. When the birds are here though, we are seeing more and more nesting behavior, including courtship displays, copulation, and scraping. We have already found our first eggs of the season, eider, tern, and puffin! I’m excited for the season to really ramp up and to find a lot more nests in the coming week. First tern nest found of the season, 5/23/2017. 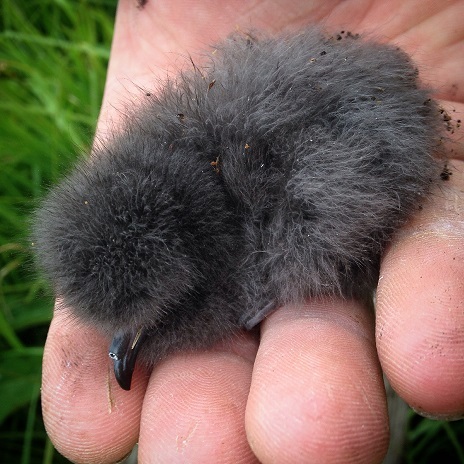 Recently on Petit Manan Island we have been conducting chick provisioning studies. The purpose of these observations is to determine what prey species are being fed to tern chicks in order to see how prey composition is related to tern chick survival rates. We also record the time of the feedings, which chick is being fed, and the size of each prey item. Over the last decade the fish diversity on Petit Manan has increased. Although it allows us to see new and exciting fish species, it is not a positive sign for the terns. Increased feedings of invertebrate species such as moths, dragonflies, and other insects are also not great signs. Invertebrates and some fish are not as nutrient rich as herring and similar fish species, making them less beneficial for tern chicks. In 2006, common tern feedings consisted of 95% herring. Data from more recent years show that herring has dropped to 25% in 2010 and 34% in 2013 for common terns. Other fish species, such as hake and sandlance, have increased in feeding frequency. Although we do observe feedings of herring, hake, and sandlance, a large proportion of the feedings have consisted of tiny invertebrates and low quality fish species. Throughout the summer we have seen a total of 14 fish species, two aquatic marine invertebrate species, and at least 2 terrestrial invertebrate species being fed to chicks. Species like butterfish, lumpfish and three-spined stickleback are not high quality prey items because often tern chicks are unable to swallow the fish. Butterfish are disc-shaped, and often they are too wide for chicks to swallow. Lumpfish are a rough, round fish species that chicks can only eat when the fish are very small. Sticklebacks, as their name implies, have spines on their back that catch in the chicks’ throat when being swallowed. We often find them uneaten near nest bowls. Some of the factors that are believed to be causing these changes in fish composition are ocean warming and overfishing. Over the last two years ocean warming has been affecting seabird populations on both the Atlantic and the Pacific Ocean. 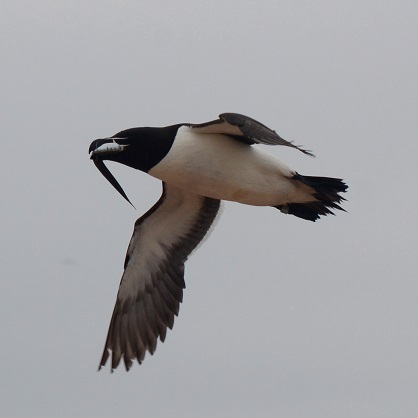 Seabirds are indicators of marine ecosystem health. Tern breeding pairs have been decreasing on Petit Manan Island for at least the past seven years, and this season marked the first time the total count of tern nests dropped below 1,000. As recently as 2009 Petit Manan was home to 2,500 pairs of terns. This could be indicating that the food availability in the Gulf of Maine is failing, and the terns are not able to find enough prey to be able to reproduce after their migration. To get a sense of what prey species are available to seabirds, we can use our provisioning data as a sample of the prey availability in the waters around Petit Manan Island. Also we can look at provisioning data to see how the rapid warming of water in the Gulf of Maine is affecting prey populations; in particular the herring population. Using data from all of Maine Coastal Islands NWR and Project Puffin islands, we can learn what is happening in the Gulf of Maine system. 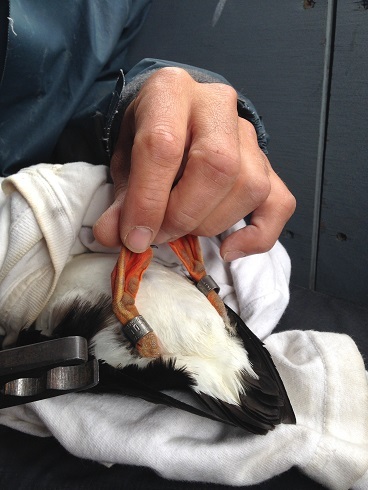 This data will assist in monitoring the effects of a warming Gulf of Maine on the marine food web and what this means for the future of our seabirds and fisheries in Maine. I have really enjoyed doing these studies because it is exciting to watch the chicks’ daily activities and often the time goes by quickly. For our provisioning studies, each person has a blind that they spend time making observations from every other day. Returning to this specific area every other day is a great way to allow us to see the progress of the chicks and allows us to get to know each chick’s habits. These studies also allow us to see many different fish species as the terns bring them to feed their chicks. This is another great part of the job because it helps us work on our fish identification skills. Petit Manan Island is well known for its seabird inhabitants, most notably our Atlantic Puffins and Arctic Terns. However, a total of eight species of marine birds return yearly to nest on Petit Manan Island. Most of these birds have conspicuous nests, such as the terns and Laughing Gulls which lay their eggs on the ground’s surface. The Alcids, such as Puffins, Black Guillemots, and Razorbills, lay their eggs in burrows or rock crevices, but the adults are still easily observed on the rocks and surrounding waters. But Leach’s Storm-Petrels, the smallest seabird denizen of Petit Manan, are a little bit trickier to detect. Leach’s Storm-Petrels differ from the other seabirds on PMI in a variety of ways. Taxonomically, they are the only species representing a group of seabirds called the Tubenoses to be found on PMI. Also, they are nocturnal and nest in often long, twisting sod burrows. The burrow entrances are smaller than the size of a fist, and tucked underneath rotting logs, debris and rocks. These life history traits make observing storm-petrels quite the challenge, and prevent accurate estimations of breeding pairs on nesting islands. urvey for active storm-petrel burrows. Instead of just reaching as far into each burrow to feel for birds and eggs, we have been playing a recording of storm-petrel vocalizations outside of each potential burrow entrance. The results have been extremely exciting! The birds have been responding with their strange, goblin-giggling call from deep within their burrows. But more importantly, this method has allowed us to find more birds than just by feeling in the burrows. In fact, 63% of the storm-petrels we located only because we heard them – their burrows did not allow us to reach them. Overall, 93% of the adults we located using both methods responded to playback. 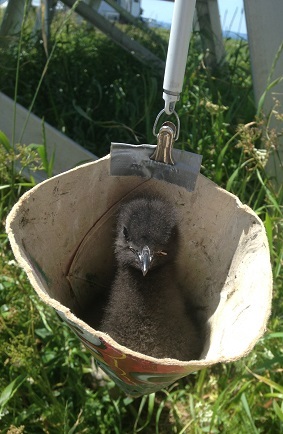 Hopefully this monitoring technique will provide new insights into Leach’s Storm Petrels nesting on Maine coastal islands! 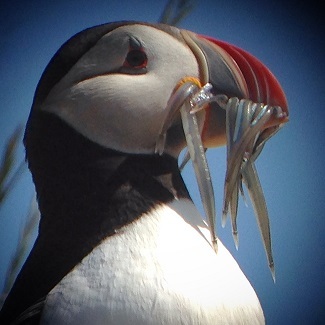 While most of the other MCINWR islands are winding down for the season, Petit Manan is still going strong with major alcid trapping, island-wide guillemot and storm petrel checks, Arctic tern re-sighting, and our new-this-year project: Atlantic puffin feeding studies. Atlantic Puffin with bill load through scope. Here are a few more snapshots of what else has been going on at PMI. 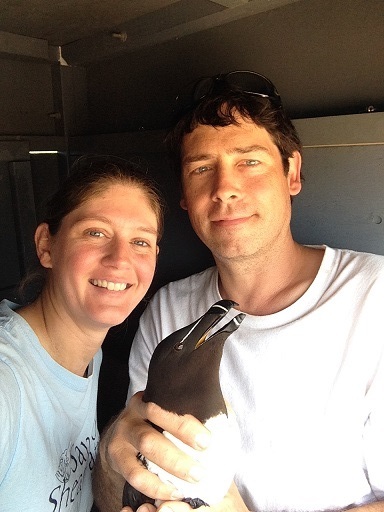 Wayne and Julia with their first captured adult Razorbill!